Hei, muistutus Penny Black and more syyskuun haasteesta, jossa kaikki leimattu käy! Perjantai parina tällä kertaa suloinen kissapari. Hi, reminding about Penny Black and more September Challenge " Anything Stamped goes". These cute cats are my Friday Couple! 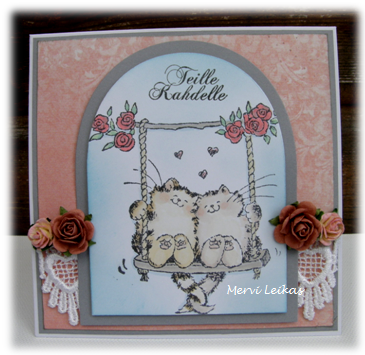 text stamped: "for you two"
As always a beautiful card Mervi and a lovely design and colouring. So adorable! Love the stamp! awww, this is so cute mervi! and i love the lace and flowers - they're the perfect embellishment! So cute and love the touch of lace. Thanks for joining us at Aud Sentiments. What a cute couple! adorable card! Thank you so much for your lovely comment on my blog!